If you wish to make a one-time donation, click on the “Quick Give” link in the lower right corner. 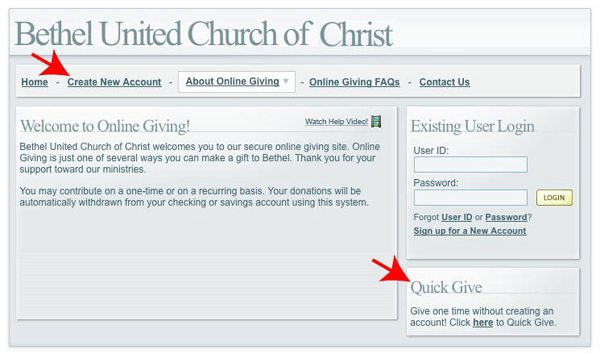 If you wish to make regular or periodic donations, click on “Create New Account” and fill in all the fields EXCEPT “Registration Code” (that’s for the church’s use only). After you have submitted this information, you will receive a confirmation email. Before you can donate online, you must follow the instructions in that email to validate your account, and then you may make donations in whatever timeframe you desire, using the “Existing User Login” portal. Thanks again for your financial support of Bethel UCC!